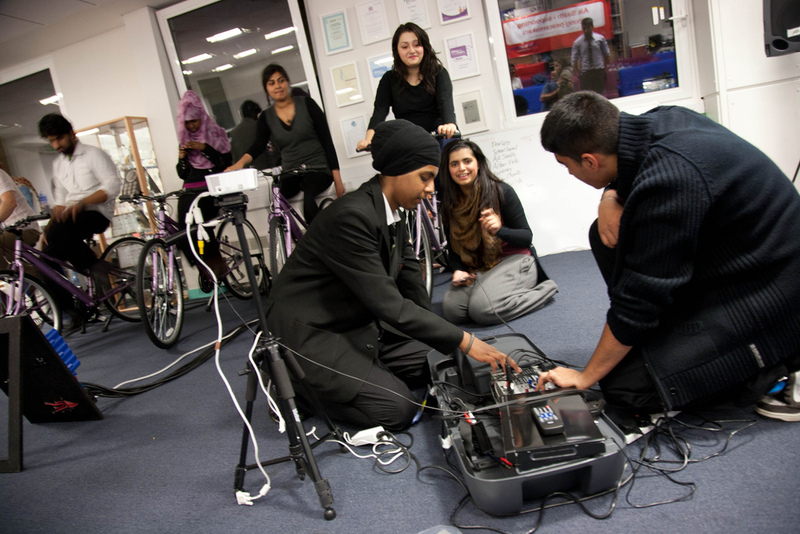 A couple of weeks ago we started the first of four pedal power cinema workshops with young people at the Aik Saath group in Slough. Aik Saath (which means ‘Together as one’ in Hindi, Punjabi and Urdu), work together to build peace within Slough and the surrounding areas, tackling racism and conflict through peer-led training and facilitation. Back in the summer of 2009 Aik Saath challenged the young people of Slough and beyond to come up with an idea for a group project that would fulfill their primary aim of promoting community cohesion and bringing the community together - while also promoting environmentalism and a healthy lifestyle. The young people presented their ideas to each other and voted for their favourite, the concept of a pedal powered cinema won. In order to make it happen they applied to Awards for All - the small grants programme of the Big Lottery Fund. Electric Pedals were then commissioned by Aik Saath to deliver this project. 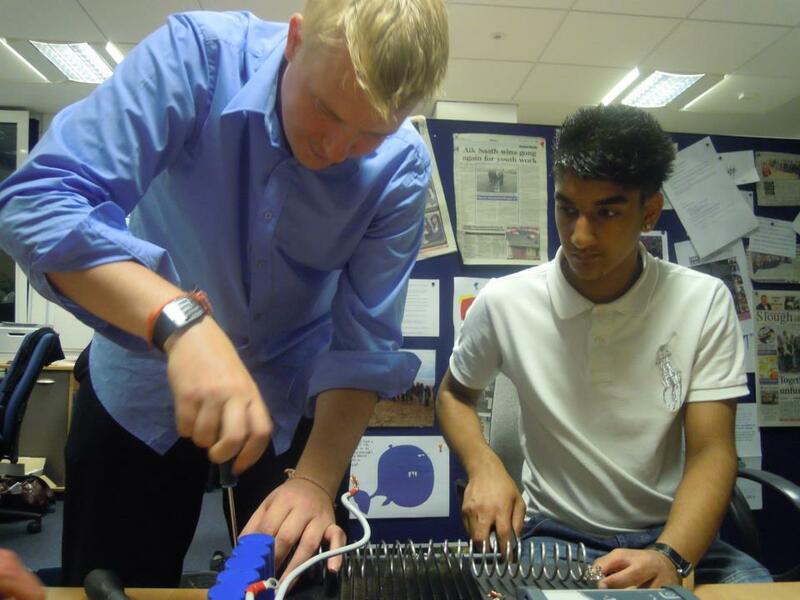 We developed a six week programme of workshops to work with the group and local young people to encourage them to share their skills and learning. 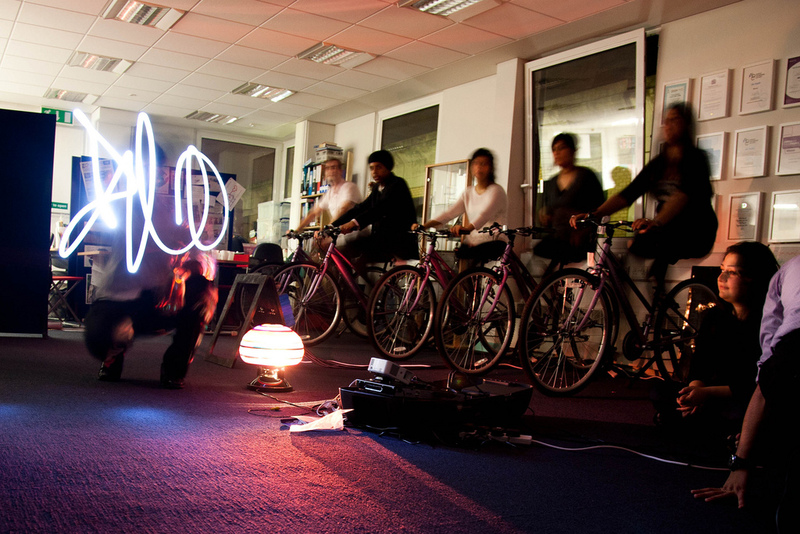 Together we built a bicycle powered cinema with the goal of leaving the kit with the group so they could run it for themselves and continue the legacy of using bicycle power to educate people about energy. We thought it might be useful to share with you our approach to the programme of workshops. We were pleased to see that no fewer than 22 young people had voluntarily signed up to participate in the first session. We felt very welcome, especially when we noticed that we had our own biscuits! We had a lot of fun getting everyone to sprint and see just how many watts each person could produce using our power monitor. We were really impressed when Asad generated 317 watts and won the power competition. However, everyone was surprised to learn that this would barely keep a large fridge going for a seconds! Generating your own energy really demonstrates just how much power is needed for the electrical appliances that we take for granted each day. At the end of the practical session each team representative gave an overview of what they had learnt from their respective sessions. It was great to see that each team now had a firm understanding of the concepts covered in the workshop and we thoroughly enjoyed passing on our knowledge of human powered events. 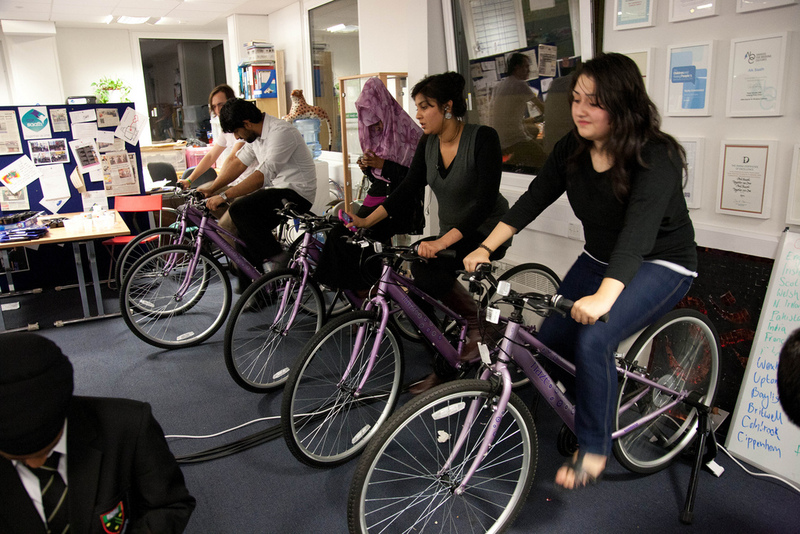 Although attendance to the pedal-powered cinema workshop is voluntary and some of the young people had started their university term and were unable to attend, there was still a really good turnout. The objectives this week were to build upon what we learnt in the last session by building and experimenting with bicycle generators. When asked the grouped clearly now understood how to build a bicycle generator, what type of energy it outputs, how to set it up on a bicycle and what safety aspects there were to consider. We again split into two teams and began the practical sessions. A volunteer from each group chose to continue the responsible of documenting everything that was learnt in the previous session – adding to the notes that would be used to produce a manual to pass on to future Aik Saath trainees. 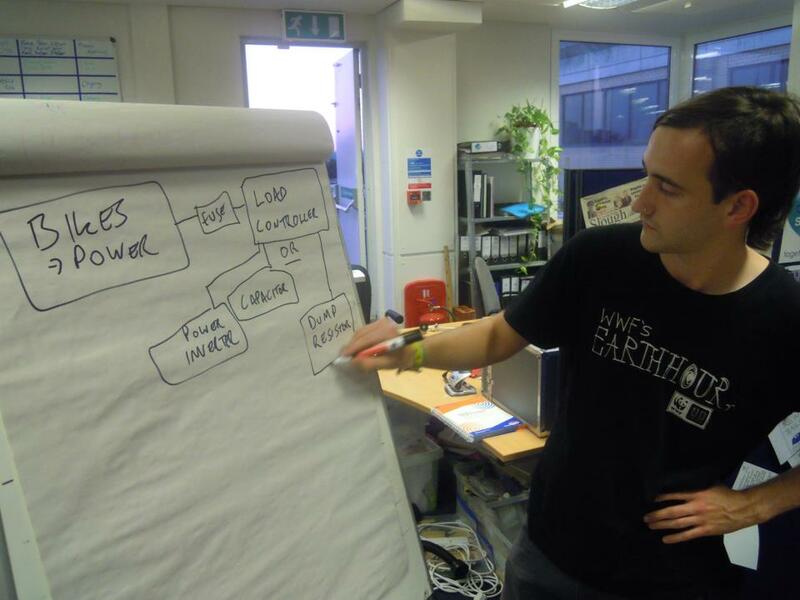 Ben explained to the group how each of the components of the mini power station are connected in series in order to manage the wide range of voltages and power that it has to deal with. The circuit is quite straight forward, even for people with little to no electrical experience. The team then got the opportunity to get their hands dirty. It was great to see everyone getting involved putting the mini power station together. Below you can see Rob (one of the organisers) showing the young people how it’s done! After a couple of hours hard graft and several cups of tea the fruit of the team effort was revealed - Aik Saath’s own mini power station. The team had a lot of fun running around the office working out just how much power is required for an air conditioning unit, a kettle, a disco light, the office sound system etc. We set up up the five bicycle generators with a second completed mini power station so we didn’t have to wait for the first team and set about powering various office items. 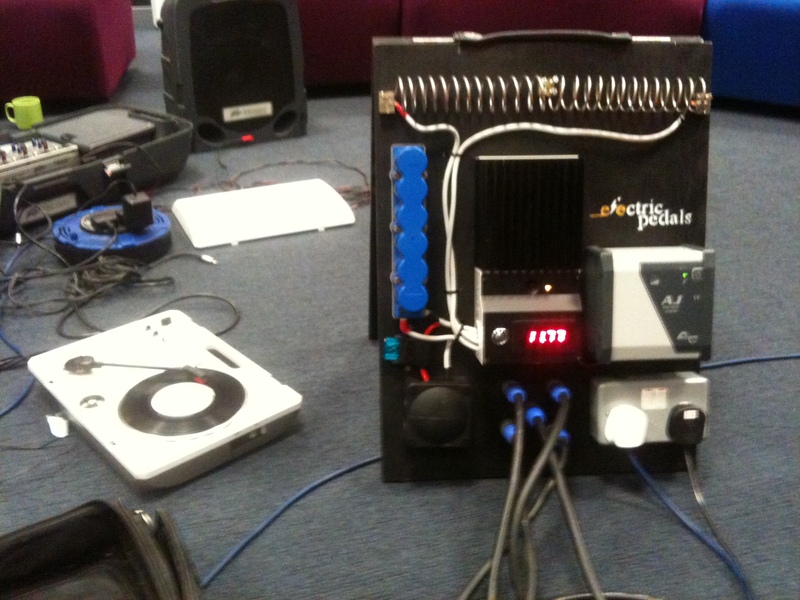 We quickly realised that the 200 watt limit of the mini power station with five cyclists would only power a handful of office appliances, for example the PA, record player and some disco lights. The 2500 watt kettle and 1000 watt air conditioning unit were out of the question. It would take anything up to 50 people to power the kettle! 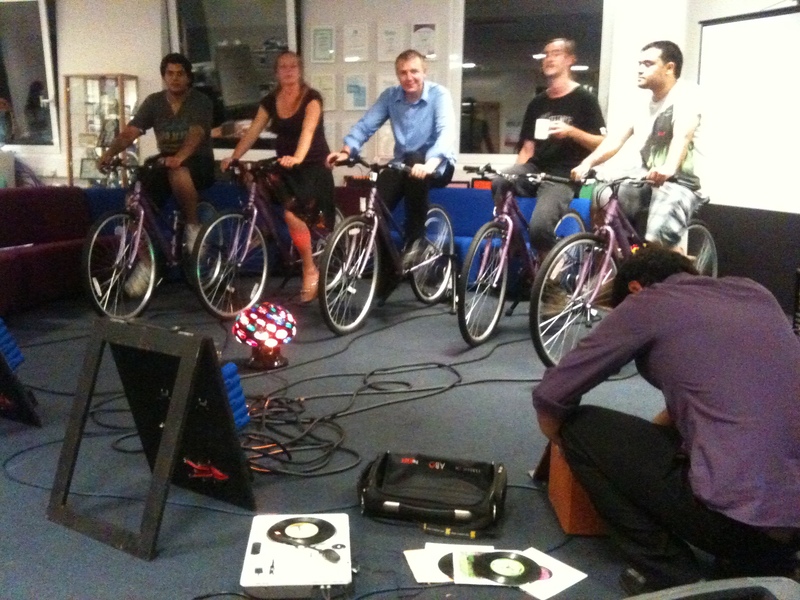 The second session finished with a much needed bicycle powered disco. 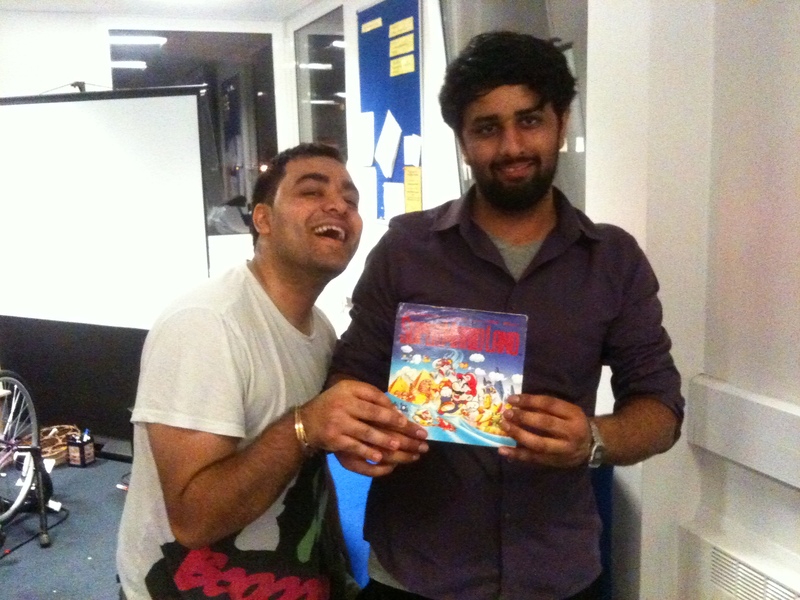 It was not long before the young people took over the music choice having spotted some of the ‘eclectic’ records we own. There is nothing more uplifting that turning calories into Ska music! SESSION THREE: Thursday 13th October (2 hour session) This session was about bringing all the learning together, setting up all the equipment and learning how to use the new PA and projector. This session was really about bringing everything that we’d learnt together and setting up all of the equipment need to run a cycle powered cinema. It was also a chance to reinforce the way that our battery free design works that relies on team work and communication to ensure continuity for each performance. That said, we knew that this session was going to be quite easy given that the Aik Saath volunteers had really taken on board what we’d presented during the previous sessions and were keen to test out the new equipment. Team A set up the bicycles, generators and mini power station and Team B got their head around how to use the new portable PA with it’s in built mixer as well as the new LED projector. Here the team is testing each of the bicycles and bicycle generators. Everything worked perfectly. So next democratic process was for the choice of film to go to the vote. Cartoons won hands down! The team were now confident with setting up alone and so it was time for some fun. We replaced the projector with Rob’s infamous disco ball (50 watts of pure beauty) and put some music on and had ourselves a cycle disco. It was an exciting evening for Aik Saath with a number of local dignitaries including Cllr Christine Small, deputy mayor of Slough. 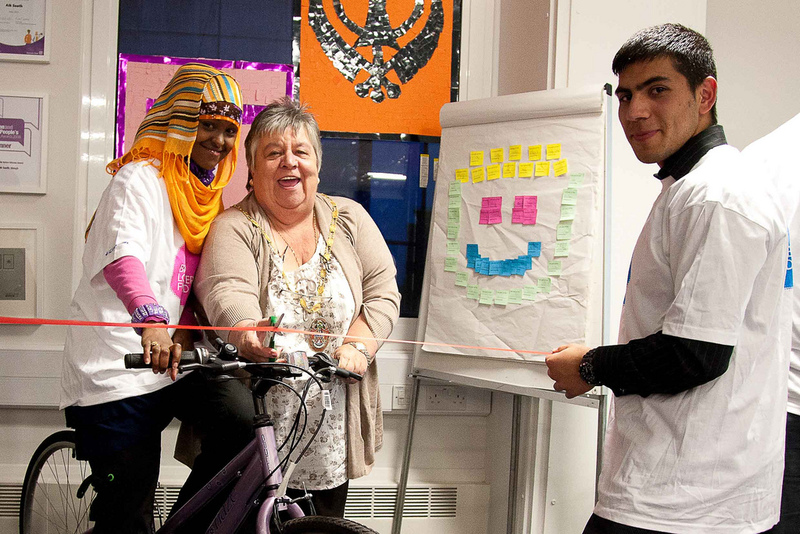 The event was to officially launch the Cycle Cinema as well as the Cohesive Adhesive blog which is dedicated to understanding and furthering community cohesion. We arrived after all the preparations had been made and the party of about 80 people was well under way. Ben and I were chuffed to see that the cycle cinema had been set up without us. All the bikes were arranged neatly and all the cables we laid out with not a trip hazard in sight. It was very rewarding. After a number of presentations by Rob and the volunteers thanking the sponsors of the event, the deputy mayor cut the ribbon to the Cycle Cinema. The cycle cinema was used to present images from the previous three sessions. We're really proud of what we’ve achieved in such a short amount of time and wish Aik Saath the best for the future.